You are here: Home / News and Events / Parish News / Community Asset! Our favourite local has now been designated an asset of community value which entitles the Parish Council to have a say if it was ever closed down. Look for this sticker on the door. 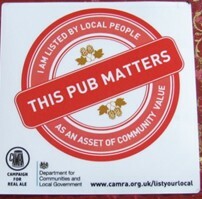 http://oldwoughton.org.uk/wp-content/uploads/2016/01/This-Pub-Matters_cr.jpg 199 202 Philip http://oldwoughton.org.uk/wp-content/uploads/2016/04/OWPC-LOGO-v2-hi-res_cr.jpg Philip2016-01-22 18:17:092016-02-26 21:54:17Community Asset!